THE NEW VERSION LOOKS FANTASTIC! BUT WHERE ARE THE LAYOUTS? WHEN I CLICK MORE, I DO NOT SEE OTHER THEMES. THE DEFAULT IS HIP BUT NOT A WINNER. REALLY DIGGING THE OTHER CHANGES. Thanks for the feedback on the new version! 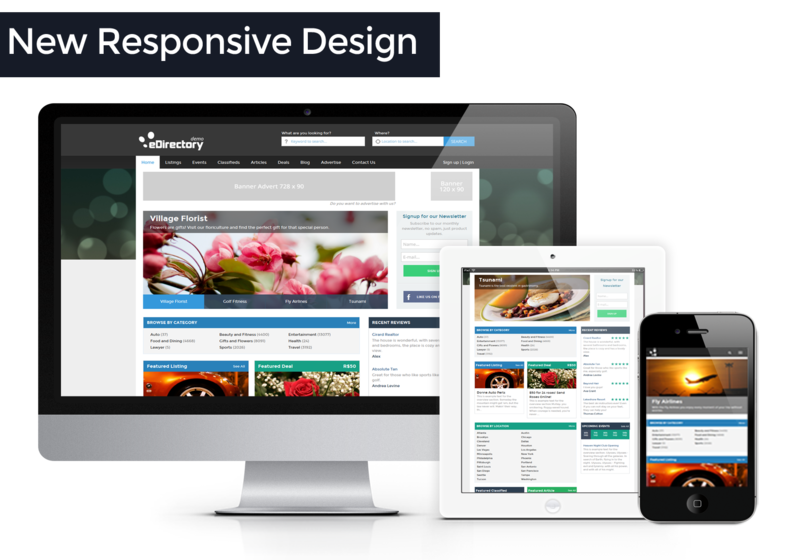 The themes were removed because we plan on releasing new responsive themes. But for now you still have the option to change the default theme color or create a new one, just go to Settings (/sitemgr) > Themes > Color Option. You’ll be happy to know that you can actually add videos to the Home Page and Advertisement’s page. For any further clarification, reach us at +1-800-630-4694 or sales@edirectory.com. Great change on the front end & on the mobile devices. all to allow sponsors to sell tickets when they create events. E.g they can paste the code or link from a ticket site. That’s a very interesting ideia. I’ll pass it to our basecode team and we may release it in a next version. Thanks for the ideia and feedback. Great release! It would be nice if Dining Guide theme also has Events and Articles features, thanks! It looks great, but on mobile it is not possible to redeem a deal or have visitors login. Also the advertisments and the ‘signup to our newsletter’ are gone on mobile view. You are right. We had to adjust a few features on the responsive version that we are still working on to improve the user’s experience. Are these features simply not going to be available at all, or is eD working on correcting this? We are working on these features to release in a next version. this is a nice update. would like more template options. v9 has a lot and v10 has 3. only 1 that most can use. the ability to hide/show articles/events for dinning guide will be good. We are working on new templates for the upcoming versions. And I’ll forward your suggestion “hide/show articles/events for Dining Guide” to our basecode team. hello gbueno, this is wonderful to hear. Very good news. I am at version 9 and need to update. Functionality to hide and show which boxes/modules are on the home page. Right now it is very busy and things are redundant. An Affiliate tracking system so I know where listing come from. More designs instead of three. Integration using API with email systems so that I do not have to export emails. Also, emails will inbox better if they send through api of vertical response or constant contact than smtp. Allow portrait photos as well. The site looks good but it is not always easy to get landscape photos. This causes too much cropping. Try it with a photo of people and you will see. Good to hear your feedback and ideas Tanner. I’ll forward your suggestion to our basecode team. I agree with Tanner and Daniel. An integrated Affiliate system will be very helpful for most eDirectory sites I have reviewed. I had it priced out one time and it wasn’t that much nor would it require much time. The reason I didn’t get it is because it would be a custom modification and then I would not get the awesome updates eDirectory has been cranking out. And if I did upgrade, I would have to have the Affiliate system rebuilt. Basecode team – please integrate an affiliate tracking system so that we can get people to help us promote our directory. Getting iDevAffiliate.com integrated should be fairly straight forward. An affiliate system would be a really handy for our eDirectory, we all agree. Our basecode team has been working on some ideas to implement such feature. We may have some good news soon. Thank you for the update. I am looking forward to the next update as I’ve been hanging onto v9.8 waiting for the next version of v10 to come out with additional themes. Something that would help us all is being able to use other email service providers to send emails. As someone mentioned above, this will help us get better inbox rates. ArcaMailer is a start but it is much more expensive than other options. Does this software run off a lisense that is called back to your servers. the reason i ask is, what if edirectory folds and closes shop. will our software still work? With Owned license you can have the software installed wherever you want to and you also have a copy of the code. If you have any other questions, feel free to send an email to sales@edirectory.com or call us at 1-800-630-4694. My current edirectory platform has major challenges with canonicalization which refers to individual web pages that can be loaded from multiple URLs. This is a problem because when multiple pages have the same content but different URLs, links that are intended to go to the same page get split up among multiple URLs and is showing up as duplicate content in Google. Please let me know if you have addressed this with the current version. Thanks. We don’t have anything new regarding this issue in the new version. Your comment was reported to our basecode team. great change .. the most part i liked is mobile responsive design, although it still need some work to fix few things like manage listing and map size, great work and great new editions. Are purchasers of the eDirectories earlier edition able to have the new updates applied? Thank you!